Long ago, Mars is believed to have a thick atmosphere and quite rich in oxygen. But now, the gas layer is lost, or at least very little left. The astrophysicists believe that the atmosphere of the red planet was seized. In a recent study, the National Aeronautics and Space Administration (NASA) revealed that the suspect usurper atmosphere of Mars that is its own parent star, the Sun. 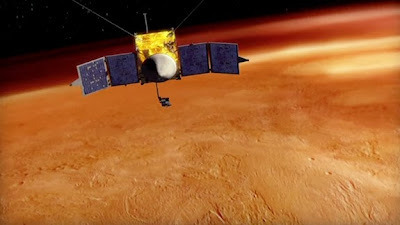 The fact was revealed by the research vehicle for Mars Atmosphere and Volatile Evolution Mission (MAVEN) orbiting Mars since September 21, 2014 last. MAVEN dive into the atmosphere of Mars is now live 1 percent from the previous and analyze the phenomenon that occurs when a solar storm struck. 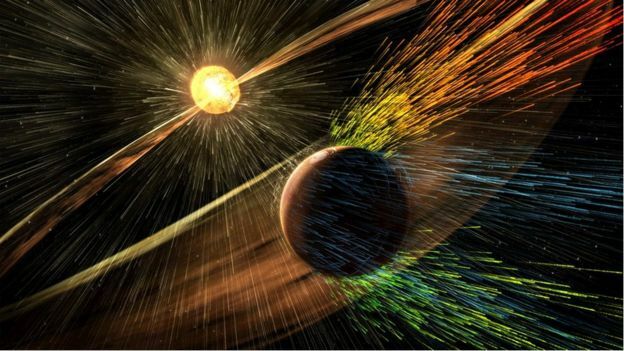 Solar storms that carry charged particles will trigger the formation of the electric field in the atmosphere of Mars, making the ions in the atmosphere of the red planet is accelerating motion. That process eventually make ion and the building blocks of the Martian atmosphere immediately kicked into space or transformed into another form before eventually disappear. Jasper Halekas of the University of Iowa who involved with the MAVEN research project said, the loss of Mars's atmosphere does not happen suddenly but through the process of 4.5 billion years. "We found that there are approximately 100 grams of the atmosphere is lost every second," said Halekas as quoted by the BBC on Thursday, November 5, 2015. Scientists also specifically examined the effects coronal mass ejection (CME) that hit Mars this year. Coronal mass ejection is an explosion streams of charged particles that move faster than ordinary solar storms. When a coronal mass ejection that struck Mars, the speed is 10-20 times faster and more capable of seizing the atmosphere. Halekas said solar storm in the early days of the solar system more vicious than this time so as to seize more atmosphere. "It shows not only that the atmosphere of Mars continues seized the moment and all the time, but also that most of the atmosphere has been lost in the early days of Mars," said Halekas. if Mars has a magnetic field shields, the solar storm will not be able to seize the atmosphere. Unfortunately, "dynamo" that make up the Martian magnetic field shields do not work a few million years after the birth.